What is the advantage of working with an event planner? By hiring an event planner, you not only save time and money, but you can enjoy the process of planning your event with an experienced professional guiding you along the way. A planner can suggest ways to stay in budget and assist you with organizing all the details. Why choose Innovative Party Planners? We listen closely to your event goals and offer advice and guidance based on our expertise and extensive knowledge of event logistics. Innovative Party Planners has built a reputable network of vendors and resources. As our client, you benefit from these relationships. The first step is to contact us; by calling or filling out our Plan My Event form. One of our planners will be in touch, so be sure to give us your phone number or e-mail. We begin with an understanding of your event goals, priorities and budget. We offer an initial one hour free consultation, by appointment, to discuss your event details. Can I come to the studio and see your inventory? We invite you to come to the studio and meet with a planner and be introduced to our team. Explore our graphics department, art studio and view our extensive inventory full of table top décor and props. All of your event décor is fabricated in our warehouse with our team of artists and graphic designers who work directly with you throughout the event experience. All meetings are by appointment. What event design services do you offer? Our design services encompass every aspect of your event offering you guidance in selecting all your event elements. 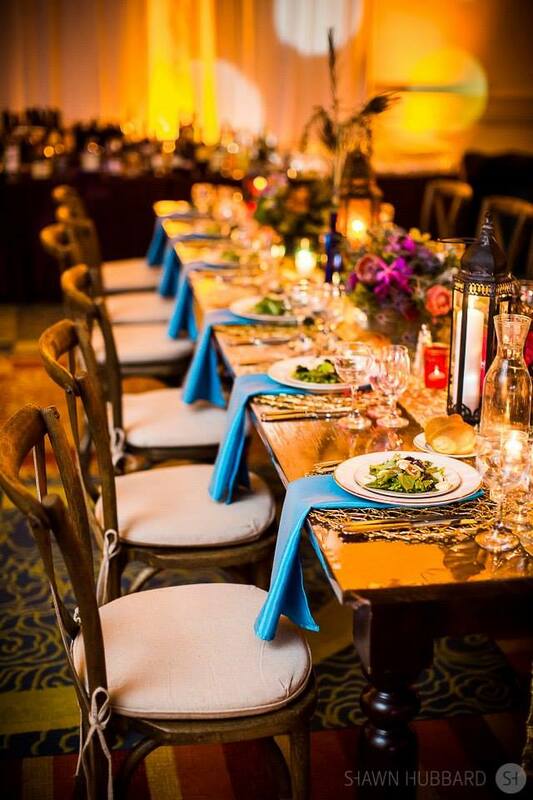 Our event designers create unique event experiences styling elements such as lighting, draping, linen, floral and non-floral centerpieces, furniture, backdrops, and more to create a total and personalized look for your event. We present our ideas on a series of style boards which are a visual representation of our concepts. Our style is colorful, clever and memorable. Our graphics department works closely with out event planners to design your party logo, save the dates, event invitations, welcome and food station signs, step and repeats, custom Snachat Geo-filter, dance floor decals, information and direction signs, sign in boards and books, event programs, place cards, table numbers, gift tags and more. For our corporate clients, Innovative Party Planners can assist with branding and publicizing your events. Our graphic design department can prepare your invitations and sponsorship marketing materials, as well as design you advertising and your social media posts to generate participation and attendance. What do your planning services include? Our experienced team of planners and event designers listen to your expectations and dreams, offer expert advice and assemble and oversee your team of experienced and professional wedding vendors who have the expertise and passion to make your dreams come alive. We can take care of all your event needs, from the selection of your event location, to the party favor your guests leave with. Our planners can recommend experienced vendors including caterers, entertainment, photographers, transportation, and lodging as well as put together a reliable team to produce your event. If you have already assembled your team we can plan your event day beginning with a production timeline to orchestrate all the vendors as well as prepare and oversee your event timeline. In addition we prepare a detailed floor plan to scale to guide you and the event team to set up the event correctly. How do you charge for your design and planning services? Our design and planning services are billed hourly. Once we have a sense of the scope of your project, we can estimate how many hours your event design and planning process should take. We are flexible, which allows you to be as involved as you want or as your time allows. Hence, we do not offer any packages. We will begin with a retainer agreement outlining all our services and your event elements and request a deposit to begin. On the day of your event, your planner will arrive with our trained event team to oversee the installation of each vendor, install all event decor and to ensure your event is set up and ready to start when you and your photographer arrives. Innovative Party Planners makes the planning of your event as enjoyable as the celebration. In addition, we offer on-site party management to all our clients where your event planner will stay throughout your event to orchestrate the production, interact with your team of vendors, oversee the flow of your timeline and troubleshoot the unexpected. Yes, references are avaliable upon request. We accept cash, check, or credit card (Mastercard, Visa, Discover, American Express) via Square. We do not keep your credit card number on file. Please note that credit card payments will incur a 3% transaction fee. Do you have suggestions for questions not listed here? Contact us to let us know!